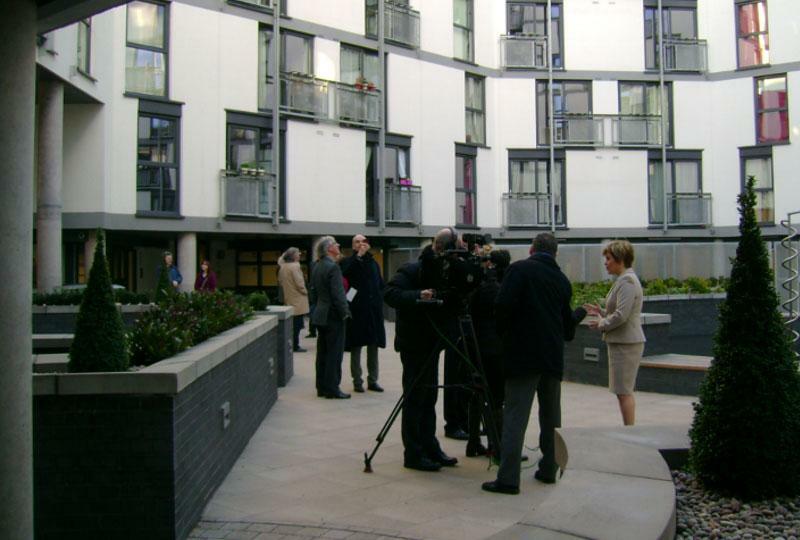 Nicola Sturgeon, Deputy First Minister officially opened Hillcrest Housing “Q10” at the former Edinburgh Royal Infirmary. The project, now known as Wharton Square, contains all the social housing on the former Royal Infirmary site master-planned by Foster Associates. She said “This innovative project, which received nearly £7m of Scottish Government grant, is delivering much-needed affordable homes in the centre of Edinburgh and is a fantastic example of Edinburgh’s Affordable Housing Policy in practice”. John Mulloy, Chief Executive of Hillcrest Housing Association added, “It has been quite a journey getting to this stage but I can safely say that it has been worth it. This visually stunning building will not only provide our tenants with great quality homes, but also, given the design and the vibrant location in which it is set, offer a fantastic opportunity for community living. The design for Q10, delivered by Richard Murphy Architects, perfectly compliments the wider development which Q10 shares with cafés, restaurants, a gym and apartments retailing at just under £1 million each”. The project of 174 apartments for mid and low rental was completed for £23m by Gladedale Ventures. It represents one of the densest and largest housing projects completed in the city. Many of the apartments have generous roof terraces and benefit from amazing views of the city and the Pentland Hills. A major article in the July/August 2013 edition of Architecture Today reviewed the project. This £20m 80 bed acute mental health hospital on the site of the city hospital in central Belfast was won in limited competition in 2011. It is a joint project with RPP Architects of Belfast and Devereux Architects of London with Richard Murphy Architects taking the design lead. 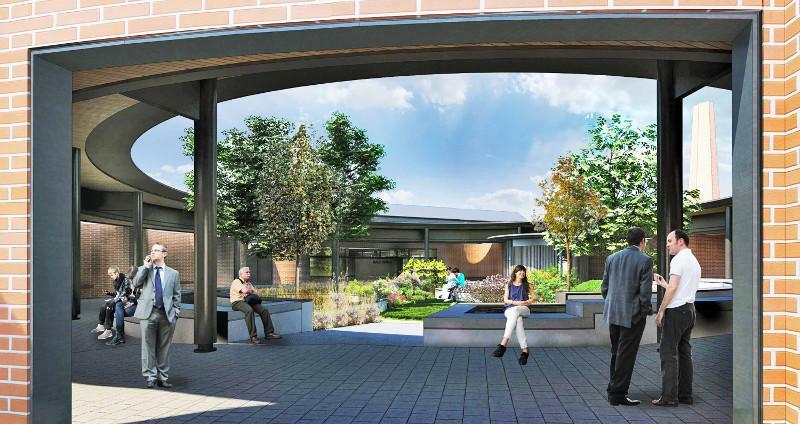 The plan is extremely unusual, having no conventional hospital corridors, instead, arranging the wards around individual gardens and placing a cloistered circular garden at the heart of the hospital circulation. A new web page has been posted here. 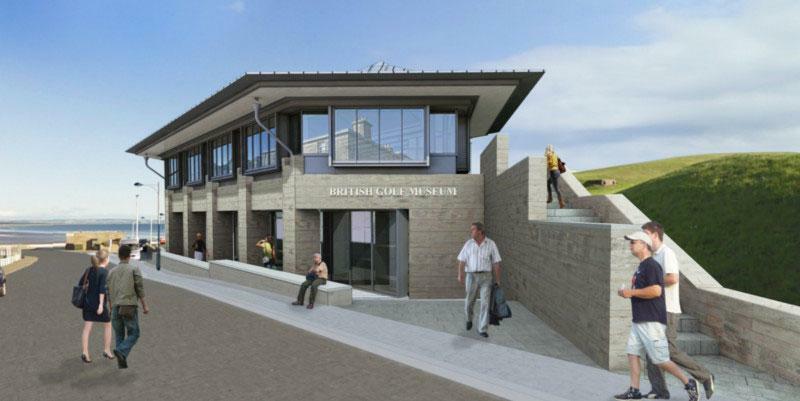 A planning application has now been lodged for a new 80 seat cafe on the roof of the existing Golf Museum. The project also amends the façade of the museum and upgrades the foyer and shop. The project will commence in July 2014 to be complete well in time for the 2015 Open Championship. A new web page describing the project has been posted here. At Haymarket we are delighted that the joint developers, Interserve and Tiger, have now completed their legal agreements and that work can begin on this large and prominent site. In North Wales, Cwmni Tref Caernarfon have reappointed us to undertake a feasibility study to extend their existing theatre, with two cinemas and other facilities. We completed their existing theatre and enterprise centre, Galeri Caernarfon, in 2005. We have been commissioned by Wheatley Group Property to design seven mews style houses in Redmonds Lane behind the Great Western Road in the west end of Glasgow. A planning application is expected early in the New Year. A major new house extension has been commission by private clients in Greenhill Gardens, Morningside, Edinburgh and a planning application is also expected in the New Year. 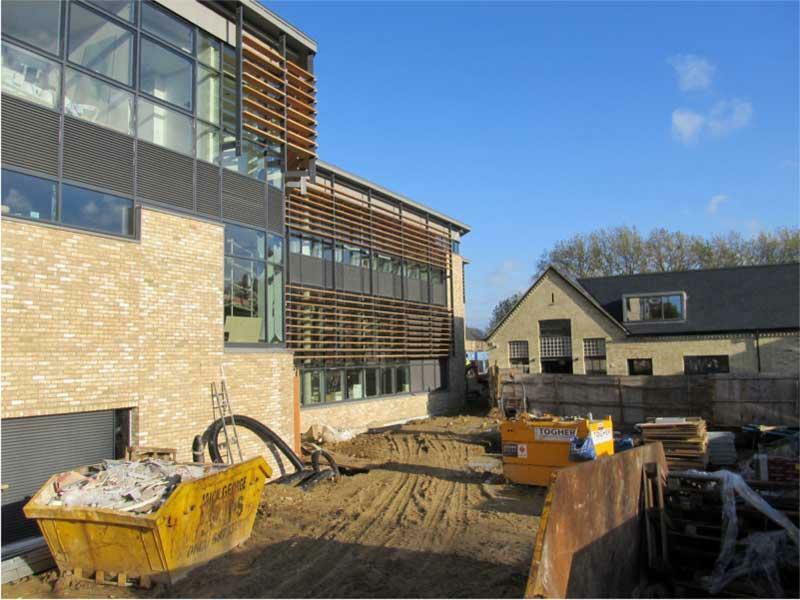 The first phase of our Young Street academic buildings for Anglia Ruskin University in Cambridge is almost complete. Handover is anticipated in early January 2014 with second phase beginning shortly afterwards. Completed photographs will be posted in our next newsletter. 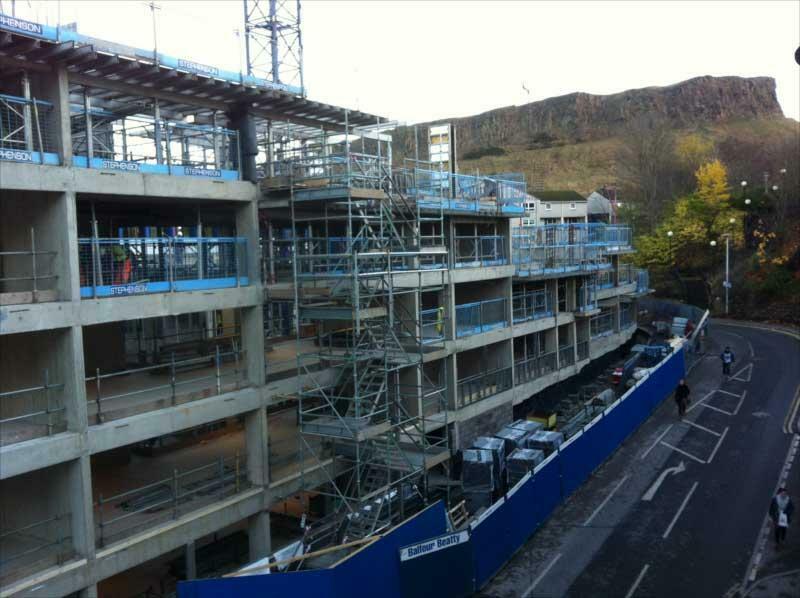 Christmas marks the half way point in the construction programme for Edinburgh University’s post graduate accommodation on Holyrood Road. The concrete frame is nearing completion and the courtyard is taking shape. The building is due for completion in August 2014 ready for the students to move in during September for the beginning of the academic calendar. 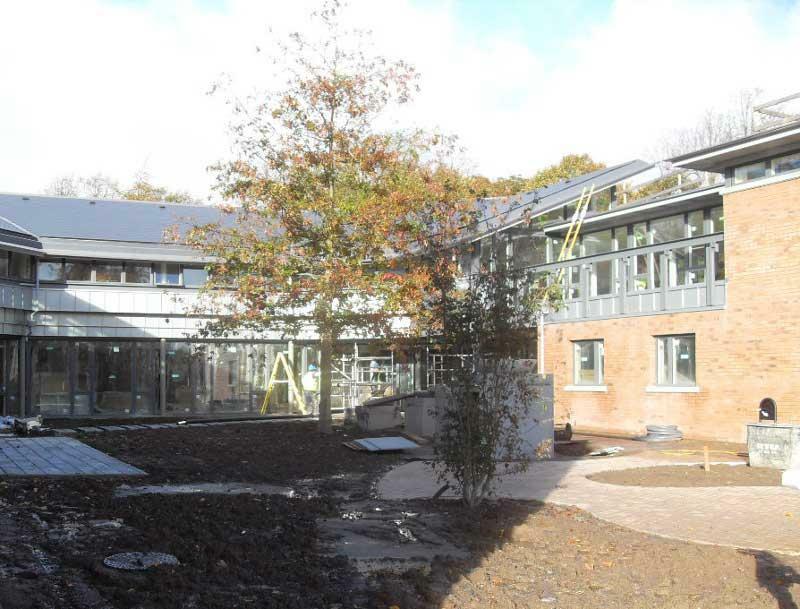 In Belfast our joint project with RPP Architects for a £5million community health project at Old See House is almost complete. The picture shows the courtyard at the heart of the design. Richard Murphy’s house in Hart Street, Edinburgh is now virtually wind and watertight. 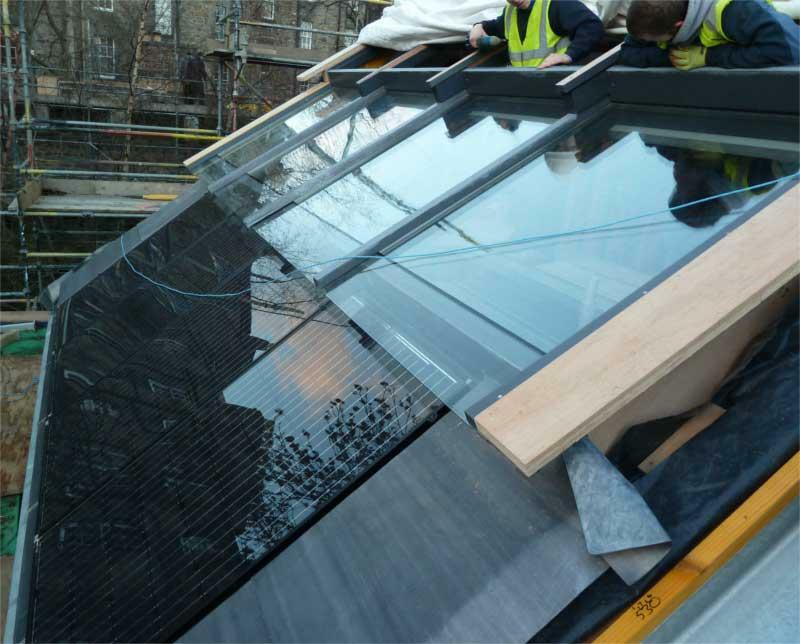 The roof of glass, lead and Photovoltaic cells has been installed and most of the glazing has also been fixed. Scaffolding is expected to be struck by the end of January and the project ready for inhabitation in April 2014. Richard was the Royal Scottish Academician elected to select and hang the annual architecture show which opened on 22nd November. The practice is exhibiting our invited entry for the Heidenheim Library competition in Germany. The exhibition is open daily until 26th January from10:00am - 5:00pm, (Sundays and 1st January 12:00 noon - 5.00pm) and closed 25th and 26th of December. We are delighted that Rachel Simmons’ conservation accredited practice “Studio Bof” www.studiobof.com/ has taken up residence in the Breakfast Mission. Rachel worked for a number of years here about ten years ago and we are delighted to have her back and look forward to future collaborations. A group of Norwegian Structural Steel Association engineers visited Edinburgh on 23 and 24 September. Richard was invited to take them on a tour of our local buildings which was followed by a reception at the Breakfast Mission. Richard gave a talk to Edinburgh University architectural students at the Breakfast Mission on 30 September and then took part in the University’s architecture student association, EUSAS, event on 1 October, as a guest speaker. 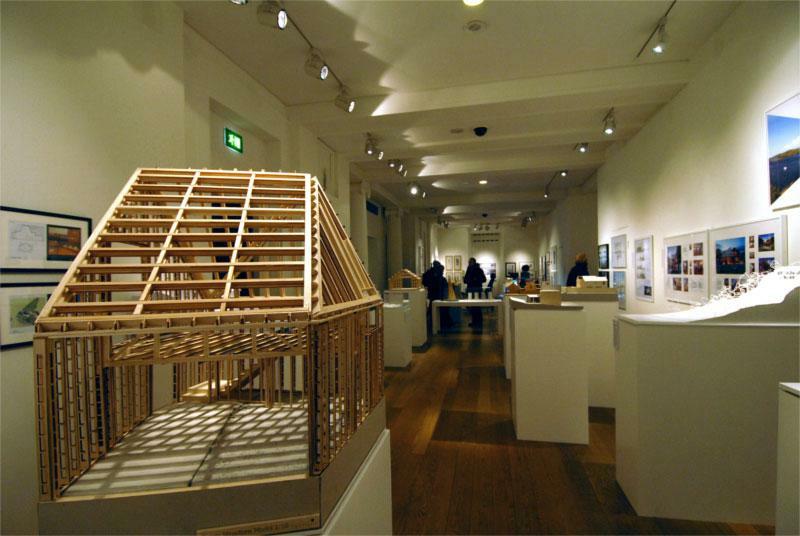 The subject was “Dissensus on / Architecture in Edinburgh” and Richard spoke about the practice’s relationship with the city. On 18 October Richard gave a lecture to architecture students at Strathclyde University, concentrating on our work on health buildings and in particular our Edinburgh Maggie’s Centre. Our domestic work in the Edinburgh area was the subject of a whole day study trip for the Edinburgh Chartered Architects Network (ECAN). Many thanks to the many former clients who opened their houses to us. A total of eight projects were visited by about twenty architects. And on 4 December the RTPI (Royal Town Planning Institute) Edinburgh Chapter and the Scottish Young Planners’ Network in association with other built environment professionals held an event at the Breakfast Mission to discuss planning and planners. Richard featured on a live Lead Development Association “webinar” as the LDA’s guest. The webinar attracted over 300 listeners. In July the completion of our social housing for Hillcrest Housing on the ex-Royal Infirmary site in Edinburgh was much reported. Architecture Today featured an in-depth review of the building in their July/August issue called “Court Appeal”. Having appeared on Grand Designs, the Channel 4 programme, the practice designed house at Strathaven airfield was subsequently featured in Grand Designs magazine in its November issue. With the title of “Ready for take-off”, the article states that “the house is a testament to the strength of using function to inspire form”. Construction magazine featured a review of current work of the practice in their November issue and “Teaching Scotland” magazine asked Richard to write an article for their November/December newsletter, talking about our approach to designing in the education and healthcare sectors. This as a result of our involvement in a nationwide architecture competition in Scotland launched by Maggie’s Centres to help introduce Scotland’s pupils to the importance of good design. Richard will be judging the competition entries early next year and one of the prizes will be a week’s work experience at the practice. In 1993 Richard wrote a monograph on Carlo Scarpa’s 1963 renovation of the Palazzo Querini Stampalia in Venice. This famous design includes a beautiful small garden where are found walls of cast concrete inlaid with specially made glass tiles of black white and gold colouring. After considerable detective work the original manufacturer in Venice (Orsoni) was tracked down and Richard visited the workshop and commissioned 150 specially made identical tiles which have now arrived. These will be placed in the cast concrete wall of the Hart Street roof terrace; a little fragment of Venice found floating in Hart Street, Edinburgh! The pictures shows the original and the new tiles temporarily placed in the concrete. 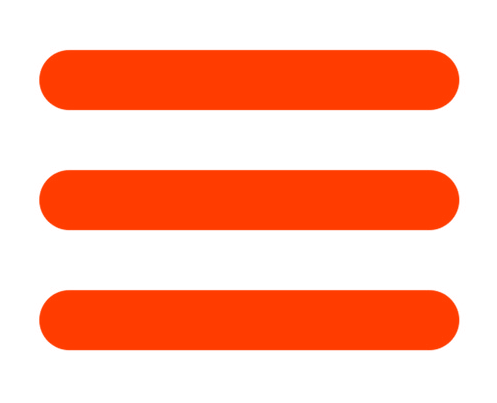 If you would prefer not to receive the Richard Murphy Architects' newsletter please click here to unsubscribe.